Update on the radiation and my status. 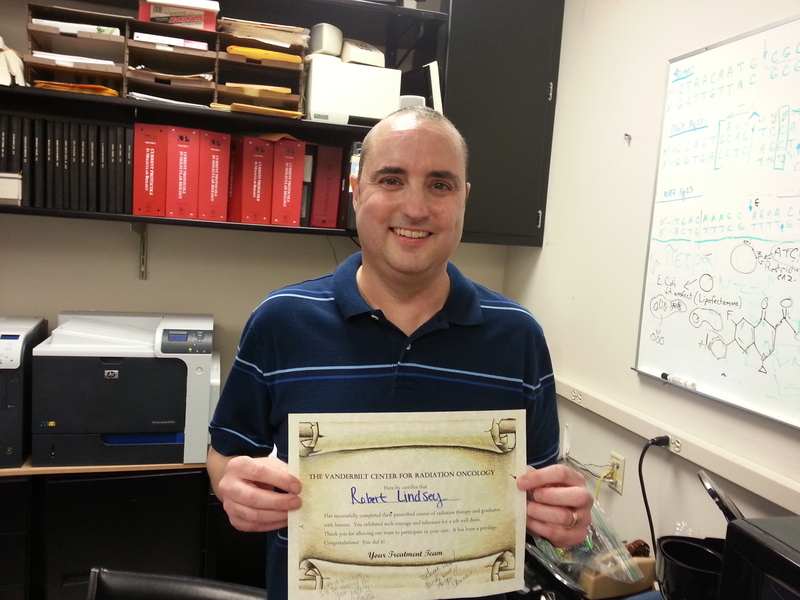 I’ve completed the head radiation treatments (see accompanying graduation pic!). The treatments were fine and I don’t think the side effects were too bad. 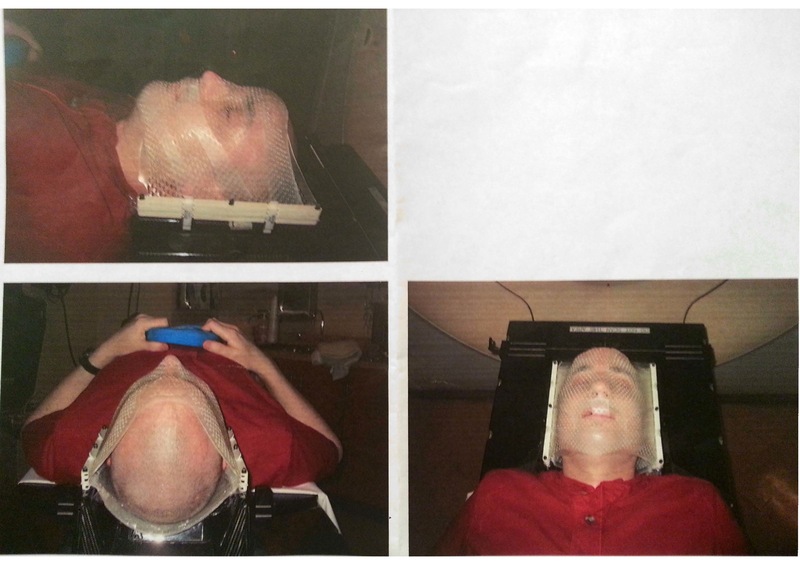 Really the worst part during the actual procedure was the mask. The docs cinch it down pretty tight so it leaves a lasting impression for a good 30 minutes after. If that was the worst thing, I was doing pretty good! I haven’t had any double vision again. I’ll have a brain MRI at the end of July to confirm the tumor is dying or has died. So that was good news. A diploma from the radiation oncology folks. My lungs have not cooperated as much as we would like lately though. I had a CT scan two weeks ago which showed lung tumors that are starting to grow again. We anticipated this; these are tumors that did not respond to the first chemo round. One solution is to subject them to another round of chemo, only with different drugs. So, it looks like I will be starting up chemo again in the near future. The news was disappointing as we were hoping to make it through the summer without having to go back on chemo. But, on the positive side, it’s good to catch it early and nip it before my hair gets any longer in case it falls out again! Right now, the drugs that I will be getting are docetaxel and gemcitabine. The drugs used for my first round of chemo (Nov-Apr) were doxirubicin and ifosfamide. Side effects are similar to the first round, but the logistics are much easier. Where I was going every three weeks for three 5-6 hour treatments over three days, these drugs require only a one day infusion, every three weeks, for 2-3 hours. The one day versus the three day infusion makes a huge difference in the psyche of chemo. Having to get up and go in for the last of the 3 day infusions was not fun. But, coming in, getting the drugs and going home to mope without the worry of going back the next day or two is much more palatable. And getting folks to watch the boys is much less painful. So, chemo shouldn’t be as taxing this time around. All that being said, it may or may not happen soon. One of my lung tumors has been causing some bleeding lately and I have been coughing up some blood in the mornings. Again, this is due to the tumors that did not respond to the first chemo round. The CT scan showed blood near a particularly large tumor near an airway. But, oncology to the rescue! I am scheduled to have a bronchoscopy next Wednesday. Basically, the docs will snake a tube with a camera down my windpipe determine where the blood is coming from. If they can reach it with the scope, they can potentially cauterize it and stop the bleeding. This should also destroy the tumor as well. Nice huh! Unfortunately, I wish they could to that for all of them in my lungs, but I don’t think they are all reachable. If the docs can’t cauterize it, they can get a precise location which then can be used for more radiation treatments, only this time on my lungs. So, the chemo depends on the results of the bronchoscopy and/or radiation. I have no problems with pushing the chemo down the timeline! And that’s not all! The CT scan also showed that my nagging pneumothorax is starting to increase in size again. (I have to stop getting CT scans!) Grrr…. Reminder that I’ve had two chest tubes for the same one and they are not fun either. But we’re steeling ourselves for another one if needed. Nothing is set yet for it; we’ll talk to the lung folks during the bronchoscopy next week and get more info on when or if one will be needed. On a positive note, my outward symptoms have not been significant enough to warrant any ER visits or having to alter my daily routine too much. I’ve been really short of breath for the past few days and have been coughing more than usual, but am able to work, be with my family and just get stuff done, which is really what keeps my motivation high. Jenn and I did make a tough decision this weekend though. One of my colleagues is getting married in Maryland this weekend. We had planned on attending for a very long time and were really looking forward to it. We made the trip plans, reservations, were going to drive (sans kids who would stay with my parents! ), enjoy a grown up wedding, and celebrate the happy couple. But my health just didn’t want to play along this week. So, disappointingly, we will not be going. What’s frustrating is that it isn’t any significant hospital stay or symptom. If something did happen while we were gone, it’s just better to be around here. It was the right decision, but not the desired one! Sorry MJ! Thanks everyone for keeping up. While the news this time isn’t great, it also isn’t surprising, which we have found, with cancer, is much better. We are still in high spirits, the boys are having a terrific time with camps and the pool. Life moves ahead and we’re right there with it. I feel fortunate to be part of it.